One of the most confusing aspects of social media revolves around content. People can figure out how to set up and complete a profile, but when it’s time to actually post content, many business owners are like a deer in headlights. Completely stumped and scared to screw up. So they either neglect posting at all, or they’ll post about their own products and services in a constant pitch fest. That is of course, unless they hire a Social Media Manager to figure it all out. When prompted, the question is a seemingly simple one: What am I supposed to post on social media? This is a simple question that many entrepreneurs have. There are plenty of folks who will not admit that they don’t have a clue what to post on social media, other than their asking people to buy their own products and services. Unfortunately, too many small business owners only post sales-related content on social media. Think about it, who wants to be sold to EVERY time they see your content? You guessed it, NOBODY. Nobody likes a constant sales pitch. Most of us subscribe to the WIIFM philosophy- What’s In It For Me? If the content is not providing value to me, why should I care? Social media fans subscribe to the WIIFM philosophy – What’s In It For Me? Are you serving value? Therefore, you need to figure out what you are going to share on social media. 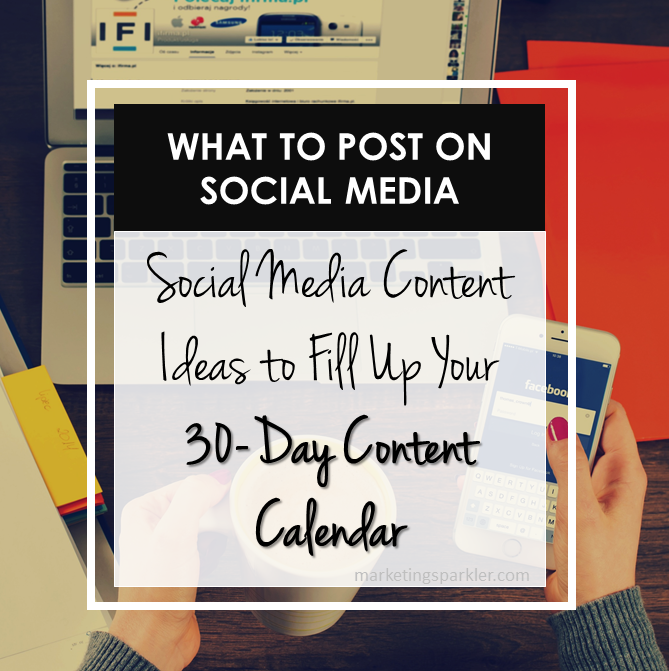 You need to create an editorial calendar and plan out your content in advance. No matter if you sell products, have a brick-and-mortar physical location, or your sell services, there is one thing that remains constant when it comes to social media. You first need to define a content strategy that not only increases your visibility and makes your brand the stand out in your niche (or location if relevant), your content needs to ENGAGE. YOUR. FOLLOWERS. Your content needs to get people to take action! How do you get people to take action, to comment, share, click your links, visit your website, sign up for your list, and buy from you? Many small business owners have a simple question: What am I supposed to post on social media? If you are ever stuck for content to post, or you need a good starting point, use this handy infographic! 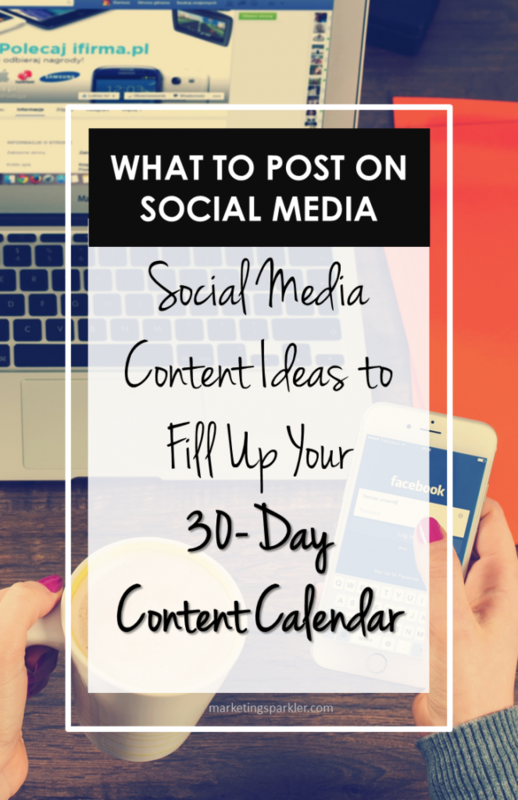 Social Media Content Ideas to Fill Up Your Content Calendar is perfect as the basis of your content calendar. These content ideas can be used no matter which social media platform you are using. When creating a content strategy, the goal is to serve your audience. We all want to win the popularity contest, and it starts with engaging content. So, mix it up! Consider your sales-related content in addition to posts that your audience will find likable and comment worthy. Grasp at the emotions of your audience and compel them to think, laugh, feel and act, and you will be on your way to creating content that elicits a public response. Start with the suggestions in this infographic!